A door-to-door salesman walks into a small Chinese town, offering magical soap for anyone willing to sniff it. A local monk wanders down looking for donations, only he is not what he appears to be. Two police officers try to solve a crime without any clues. A forest ranger has a meltdown after someone cuts down one of the trees for which he is responsible. Free and Easy is a small-scale, modestly budgeted Chinese comedy with a very dry sense of humour and a clear love for the absurd. Shot in location in the country’s icy north-east with a cast of non-professionals, it is a very odd – and oddly addictive – experience. Zhang Ziyong plays a wandering thief masquerading as a soap salesman. His method is pretty simple: he meets someone, offers them his soap, they sniff it and are immediately rendering unconscious by the drugs baked inside it. He then pilfers their belongings from their body while they lie asleep. Before long he runs into a Buddhist monk (Xu Gang) who wanders around selling talismans to passers-by. He is not a monk at all, but rather another criminal selling fake talismans at inflated prices. It is little wonder that the two men have so much to talk about when they meet. The two criminals are surrounded by a deliberately absurd set of supporting characters. In addition to the defensive forest ranger and the two broadly incompetent cops there is also an uneducated young man (Gu Benbin) searching for his long-vanished mother, and a landlady (Wang Xuxu) who takes Zhang in as a lodger. Their respective stories play out among each other’s, creating a sort of slow-paced, messy, almost sleepy kind of a story. This is a very relaxed, low-key film. Director Geng Jun has a hugely effective approach to comedy, and that influences the manner in which he shoots the film. Off-screen action is a huge element. In one key sequence a single cop attempts to force four men to stand still. Every time he aims his pistol in one direction, half the men run off-screen in the other. In another scene both cops have a banal conversation for literally minutes before Geng’s camera pans over to reveal the bored woman fruitlessly waiting to file a report with them. This is the sort of film that seems almost thrown together at a first glance, but which gradually shows off just how meticulously and carefully it has actually been put together. 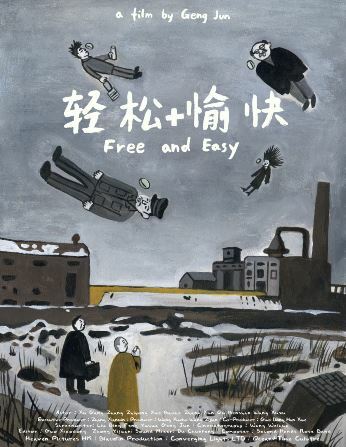 As with many independent Chinese films, Free and Easy almost eschews a musical score entirely. What music is included is hugely enjoyable, and is played by the Second Hand Rose Band. The town setting is hugely evocative: dusted in snow, falling apart, and almost entirely abandoned. It continues what seems to be a running theme in contemporary Chinese cinema, which is the growing abandonment of small towns as people leave for the cities in search of better jobs and more money. This is the third film with such an underlying theme I have seen this year (following Ghost in the Mountains and Stonehead). The cold, wintry isolation and run-down aesthetic gives all of the comedy a slight edge. It feels almost bitter. It may be slow, and its story may feel oddly small-scale and petty, but there’s a charm to it that is difficult to shake off.